Organisation: Area size relevant to players - but this will probably be ok for pretty much all ages. On introduction of balls you will need to increase the middle channel to around 10m especially for the older players. The lead player attempts to run to either sideline without being tagged. Each group should work as leader for 3 mins. Progression can be the leader now has a ball at his feet and the exact same process is followed with the tagger with no ball chasing the dribbler with a ball. Initially you will get no success - probably in the case of young players for a couple of sessions. But you will see progressions; your best player at any age will be able to do it. Its game real even if there is no success. Organisation: Area of 20x20 , play a 5v2 Using 4 goals, get players to use quick passing and movement to create space and keeping possession. 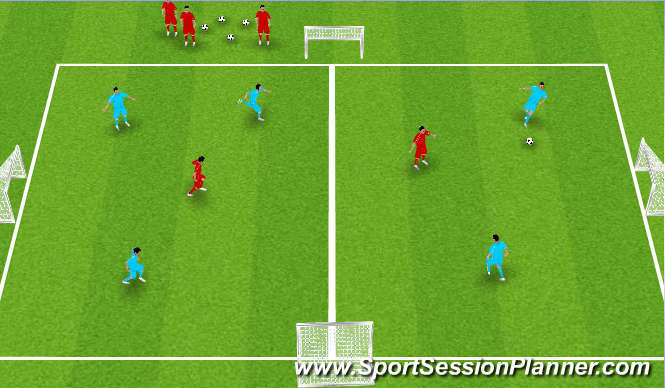 The attacking team need to make 5 passes before scoring in any goal to gain a point. If defending pair win ball they can score straight away in any goal to also score a point. 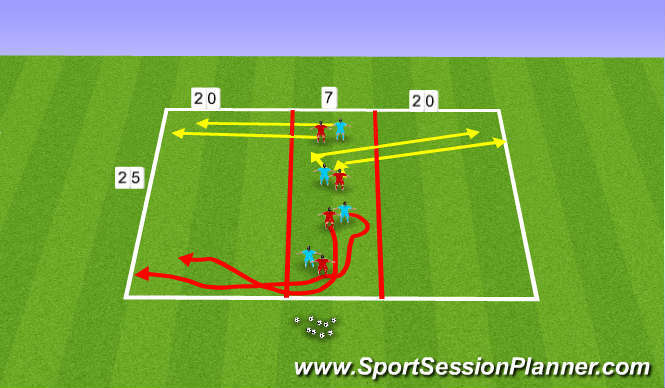 Organisation: A 4V4 Game on a 40x30 pitch, any extra players to become neutral on the outside of area. Wide players only used to maintain possesion.